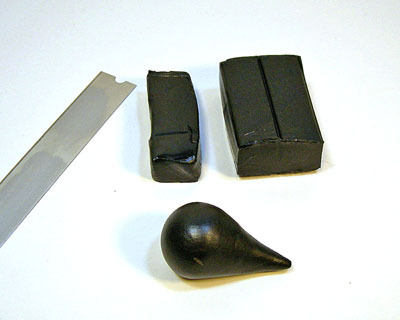 Open the package of clay and break or cut off one of the 4 sections. 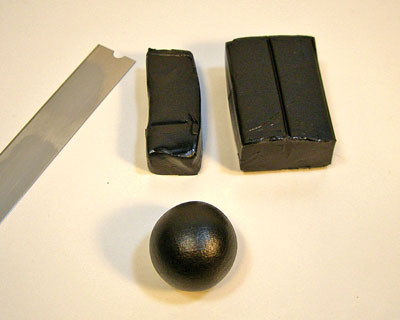 Roll it between your palms to create a sphere. See, no conditioning necessary – this clay is so soft right out of the package that it just mushes right up, which can be a good thing or a not so good thing, depending on what you are trying to achieve. But for our purposes, it's a very good thing! Then place your ball of clay down on your work surface and roll one side of it back and forth with just your index finger until it elongates into a point. You can also do this by holding the ball in your hands and rolling the end of it back and forth with just the pinkie sides of your palms. Either way, you should end up with a teardrop shape. 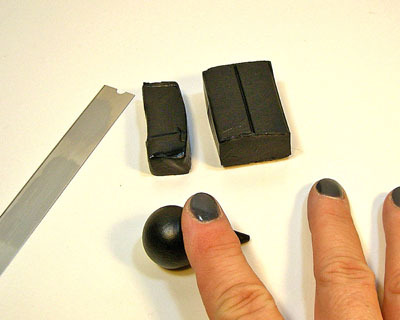 Take your old credit card or bone folder and press it into the round end of your shape, dividing the top into 2. Pull the pieces apart a bit, and hey, presto! Heart shape! You can now gently smooth the clay and eliminate fingerprints by petting it gently with your index finger while it's lying on the work surface. Since this will be a pendant, it's fine, in fact preferable, that the back of it gets flattened. You can also smooth out the cut part at the top. 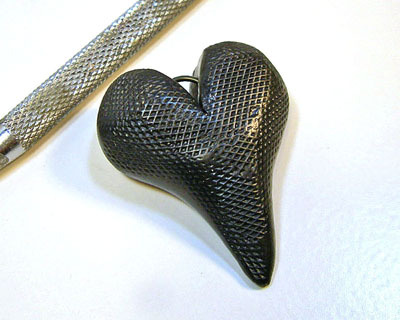 Now take your 2” of wire and bend it around a pen or needle tool to make it an arc shape. Press this into the top of the heart to make a hanger. After it's settled down in the clay, press the clay around it so that it's sealed in. Now the fun part! Find some things to make texture on your heart. I've used bead caps and my needle tool to make the different textures in the three hearts. 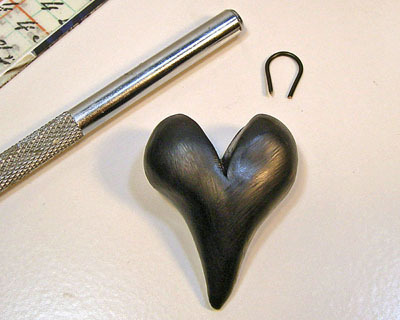 With the needle tool, I have used it like a mini rolling pin and just gently rolled some texture across the heart. You can pick up the heart to get the sides done. But don't worry about being perfect – this is totally free form! Now bake the hearts according to the directions on the package. I cure mine for the full 30 minutes, and sometimes another 30 for strength. Just don't use a higher temperature than recommended, or, AAACCKKKK! burnt clay! If this happens, open the windows and leave the room for awhile, since the fumes from burnt clay are not good for you. 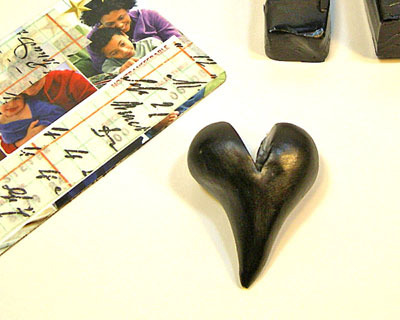 Allow the cured clay pieces to cool completely. Okay, let's gild! For the first two hearts, I simply picked up some of the paste on my finger, and carefully patted and rubbed it onto the heart until I got just a LITTLE more than I liked. The reason for this is that some of it will come off. For the third heart I used a different technique, which leaves the gilding in the recesses of the texture, rather than on the surface. Pour a little bit of paint thinner or mineral spirits onto a disposable palette, and wet your brush with it. 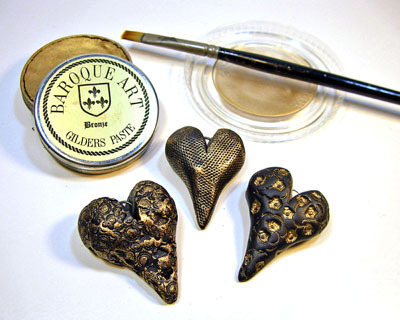 Then you can use the Gilders Paste as paint! Pick up the paste on the moistened brush, and paint over the entire heart, making sure to get the paste into all the nooks and crannies. You may want to wear gloves for this, although the Gilders Paste washes off easily with soap and water. Then while the paste is still wet, wipe it off with your paper towel. The gilding will remain in the recesses. Let your pieces dry for about 15 minutes, and then wipe them with a clean paper towel. This cleans off the excess so you don't get gilding on your clothing,a s well as buffs the paste to a shine. Then let them completely dry overnight. Hey! Cool hearts! 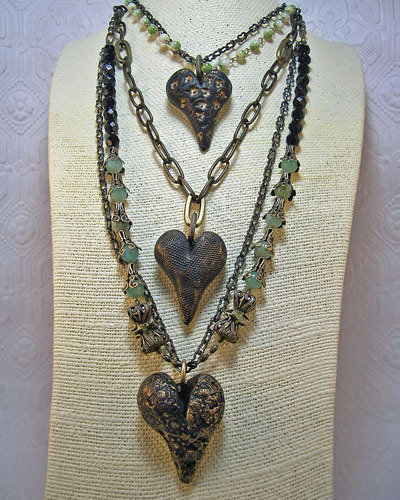 Just add a large jump ring for a bail and put it on a chain, or use it in a necklace design. How easy was that! 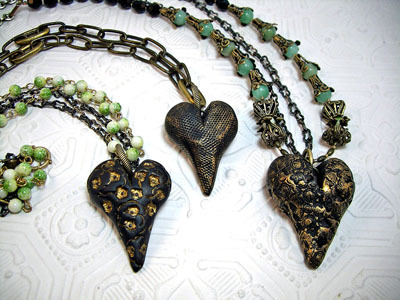 Laurel Steven has had a long and varied career in the creative arts, including many years as a singer, actress and occasional tight-rope walker, moving through years of lackeydom at a major record label, and then designing and selling handmade window clings, but always retaining a love for creating jewelry. 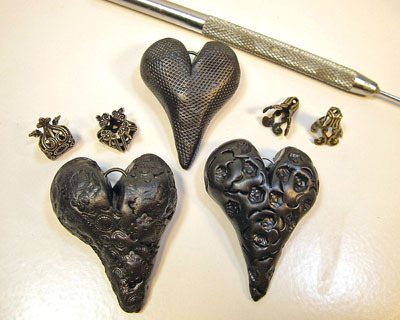 Over the last few years she has concentrated on developing and refining her style in polymer clay and mixed media jewelry while teaching at stores and events and searching for the now-elusive day job.